Located in Wilton, NSW, just 20 minutes from Wollongong and 1 hour from Sydney, Bodhisaddha provides a forest sanctuary in which monks and laypeople have the opportunity to encounter and practice the path of spiritual development taught by the Buddha. The resident community of monks have an ideal environment to cultivate lives of meditation and service, while allowing visitors to receive teachings and to develop qualities of generosity, faith, mindfulness and wisdom in line with the Buddhist path. Dedicated towards bringing peace into the lives of individuals and the surrounding community, Bodhisaddha welcomes all traditions that share this vision. The walls for Bodhisaddha Hall have started to come up. Getting ready for the placing of the shrine for the Buddha statue soon. Photos from the alms round in Wollongong yesterday. Earthworks have been completed and now is the preparation for the pouring of the concrete slab. All underground services must be run first. Good work, so happy to see the progress. 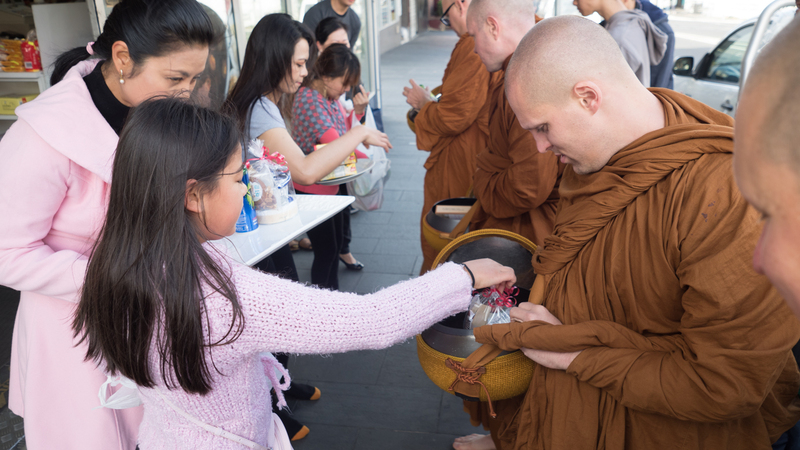 Keep updated with the latest news and events by subscribing to the Bodhi Buddhist Events Sydney Newsletter. Sent from newsletter@bodhi.org.au twice a month.